Glad to see you're working on this! I started working on a model of the Leonov over a year ago, but it stalled for a while and I've only recently picked it up again. I may start a separate thread about it. I'm modeling in Animation:Master, but my approach is to draw the hull details in Illustrator, import them into A:M and extrude. Most of the grooved details are bump maps. What are you going to do about the red star and "CCCP" that go above and below the ship name? These would best be suited for a decal, but you can't apply them to that kind of corrugated surface. It looks like you've modeled the rectangular shapes at the corners of the nameplate section as pyramids, but looking at the movie footage, I don't think they are: they're flat and divided into a lighter and darker triangle. The detail on the front end of the ship that you modeled as a grid doesn't seem to be correct either: if you look at the scene in the movie when the Soviet and American crews are confined to their ships, there's a shot of Captain Kirbuk looking out of the bridge windows, and that section of the nose is made of horizontal ridges. Will the airlock adapter be included with the model kit? I suppose it would be so small it might end up having to be made of photo-etched brass. 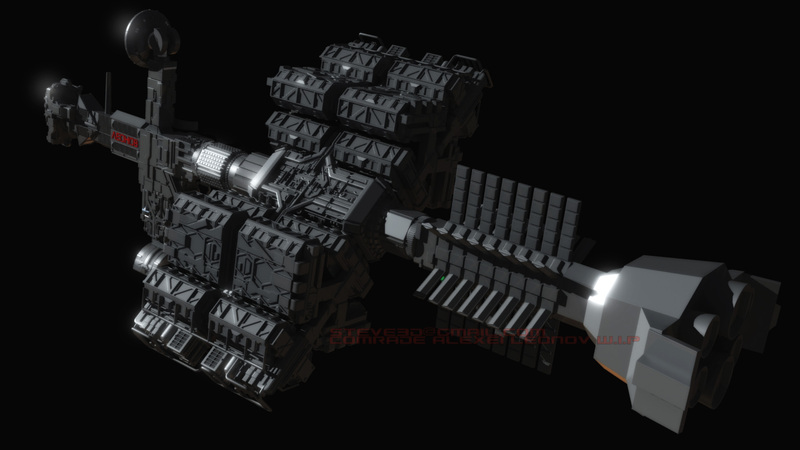 Is the ballute storage container mounted between the radiators going to be a removable part? I can't tell from the lighting in your render whether you've modeled the panels on the module with the hexagonal cross-section just forward of the centrifuge with four long strips, or a 4x9 grid of squares as it should be. On the centrifuge habitat modules, are you going to take into account that each module has a slightly different set of greebles? It's something that I'm debating whether I should include on my model, or just use the same instanced model for all of the modules. Good luck trying to model the aft side of the mast -- there are no good shots of it in the movie at all. Are the Planet Hollywood photos you have the same ones I've seen: a set of six photos that look like they were scanned from 35mm prints? I think the model in Planet Hollywood was the smaller 6 ft version, because it doesn't have some of the details around the engine section that can be seen in closeups from the movie. That Planet Hollywood in the Champs-Elysees went out of business a couple of years ago, so who knows where that model went now. When you do the engine section, are you basing it off Syd Mead's drawing of the engine nozzles? well there's maybe a few tiny innaccuracies, they'll be unnoticable in the kit so i'm not concerned. Its an immensely complicated model and you clearly have an intimate understanding of certain areas of it, You could spend your entire life on recreating Leonov, but you're not going to produce many kits that way. lets put it this way, here's the competition http://www.starshipmodeler.com/2001/jg_leo.htm at a similar scale, this ones a bit smaller perhaps, 11 inches vs perhaps 12-13 inch for my model. Basically to nitpick it too closely is perhaps unreasonable given the production requirements... This is going to be the best Leonov out there, and the beauty of model making is that if you spot something you dont like, you can of course add your own improvements, make it look more like a different version or whatever. the ship in the planet Hollywood photos is definately the 3 meter version... Remember that model is in bad shape, its been knocked about, shipped around, handled by stallone's clumsy mitts, probably.... and parts are missing, parts are wonky, some parts are broken. In order to make something that truely represents the ship in the movie, my own personal philosophy for this particular project is that its fine to grab references from where-ever and make them fit... So its in some ways a scale gestalt of all the versions in the movie. a purist might want to just use one model and stick to that for everything which is fine, but for me this is impractical. As for the engines i'll basing it off photos of the models, is there some benefit to using syds drawings? i dont have those btw and i've yet to even begin the engines but generally i'd use pictures of the models rather than pre-production drawings as so often things change. Cannot wait to see the Engine layout you have planned for this. there are on the Engine details. But I know that if anyone can't work this out, it's you.. I have to be honest I never seen the film. Keep meaning to, but don't get the chance. Hopefully Film 4 will show it when they do the sci-fi week/ month later on in the year. Wow, now there are some bold and powerful statements my Brother. While I can't argue the heavily shadowed Leonov and Discovery are much more realistic. Can't wait to see the Engine details. Couldn't get much on this and I just couldn't get passed this in my head. And the flight deck was another weird layout, seemed out of scale with Discovery's flight deck. Some different angles if you please. :)If you're worrying about the interior i'd treat them as if they have their own scales. Discovery's size is larger than in 2001, though it becomes confusing since the interior sets do not reflect this - they should be far roomier. Supposedly Hyams wanted to depict a larger discovery, i guess perhaps because it became clear that you can't fit any interior in meades design at the scale its meant to be, based on descriptions from clarke's novel. So its a little messy where that's concerned... i'm not sure if its an oversight, or just trying to make the best of a difficult effects situation. As for the lighting, i only mention it because its difficult to grab references from it.... I wouldn't say the movie is better than 2001, but it complements it nicely, its certainly a little more conventional and accessible to those who couldn't stomach the first movie, so if you like scifi i'd recommend it, whether you liked or hated 2001. As mentioned on Stargazer's website, the Discovery's interior sets require the command module sphere to be 60 feet in diameter, but compared to the size of the space pods and the pod bay doors, it's only 40 feet. 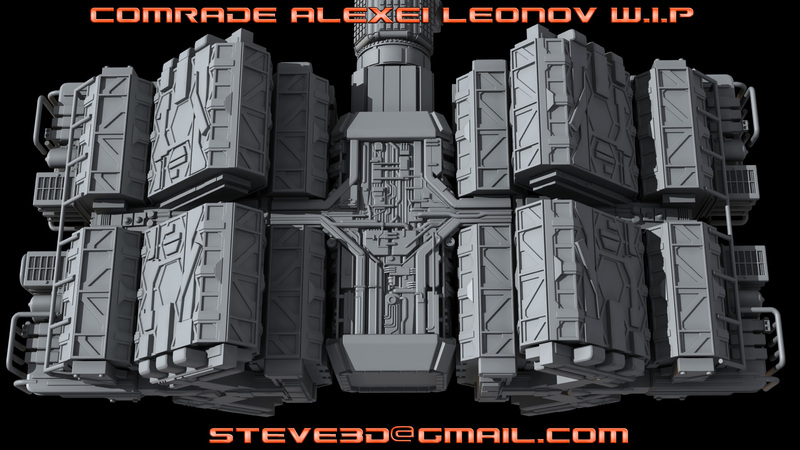 In the scenes from 2010 when the Leonov and Discovery are docked, the Leonov is about half the size of Discovery, but based on the sizes of the Leonov's airlock and pod bay doors, they should actually be about the same size. So Discovery is about twice as big as it should be in 2010. Oh well, there's nothing you can do about it. It's hard to compare the doors on Leonov and Discovery because the Discovery's emergency airlock is on its port side, but the Leonov's doors are starboard. Once your model is finished, it would be very instructive to put the two models next to each other and turn the Leonov around to look at the sizes of the airlock doors. 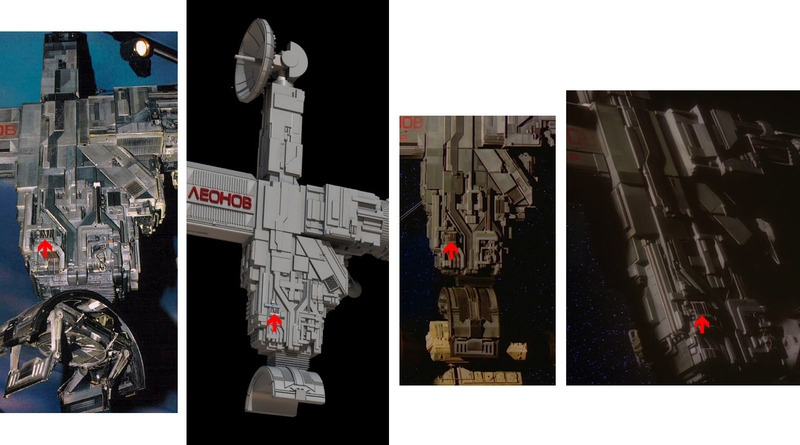 2010's discovery is redesigned in some ways to accomodate scale changes, primarily the airlock for example is, proportionally, about 2/3rds the size as shown in the previous movie. Its clearly meant to be a larger ship itself, rather than leonov being too small... Externally, if you accept that discovery is a lot bigger for some reason, then the ships are in scale. But concessions have to be made in terms of budget, inconsistencies creep in... and, well it happens all the time, from starwars to bsg, I try not to worry about it and just enjoy the show. Cool, one of my all time favourite ship designs, tough to beat a bit of Syd Mead, I'll look forward to see where this one goes. Coolhand, thanks for letting me know about Deschamps' book. I just bought a copy of it. I noticed that on Deschamps' photos, you can see that each of the centrifuge modules has slightly different greebles applied to it, although he doesn't mention this in his discussion of the panels that make up the modules. Is this something you'd want to reproduce on the model? Also, have you seen this picture from the auction of the partial Discovery model? It's probably the only available reference for the scaffolding on the top ends of the centrifuge, since those parts had fallen off the miniature before it was exhibited at Planet Hollywood. there are several different, but repeated variations, documented in the book, which will be on there.. basically theres a central bit of detail thats missing still.. he makes a big deal of that, and the 'dog leg' detail which are the major variations. but its the same thing thats repeated / mirrored. those are definately going on, i have the missing peice laying around in the scene somewhere. It's on my to-do list. aside from that, there's a number of small details which are altogther more random, and much smaller. i might go back and add them at the end if its felt its needed.. might be nice to leave it as super-detailing for an intrepid modeller to work out, and would also simplify production slightly. needless to say, i'd have to make them up to a certain extent anyway. It might be nice to have a small sheet of details that one can cut up and apply as they like... but eh.. will see how it goes, the details are tiny at this scale. I absolutely have not seen that image, and that would have been immensely useful earlier, not only for this, but for discovery that i completed earlier in the year. its a nice view of the scaffolding, from that angle, thanks. Oh wow, I can't believe you made this pipe crooked! It's just a piece that broke off on the miniature. You're also going to have to refer to the film to model the other side of the rotation hub, which has slightly different details. Deschamps couldn't get any pictures of it because it's right up against the ceiling. if you look closely, that little cluster is one of the few things thats a slightly different colour, so thats code for not being made a 'solid' printable part of the model yet... and as you pointed out, there's a reason for that. your 2 film examples i'm pretty sure are from the 1.8m model which has different detailing and proportions anyway to the 3.something metre model in the book/planet hollywood. these models are basically one object and one continuous surface as opposed to a collection of intersecting objects, so things are hard to change once they're set, even if they are set, doesn't mean they're 100% accurate to any particular model. Essentially It's been something i've been meaning to check out and have left out of the whole for the meantime. Either way, In all likelihood, i'll just stitch those parts in as they are, i think they look more interesting. 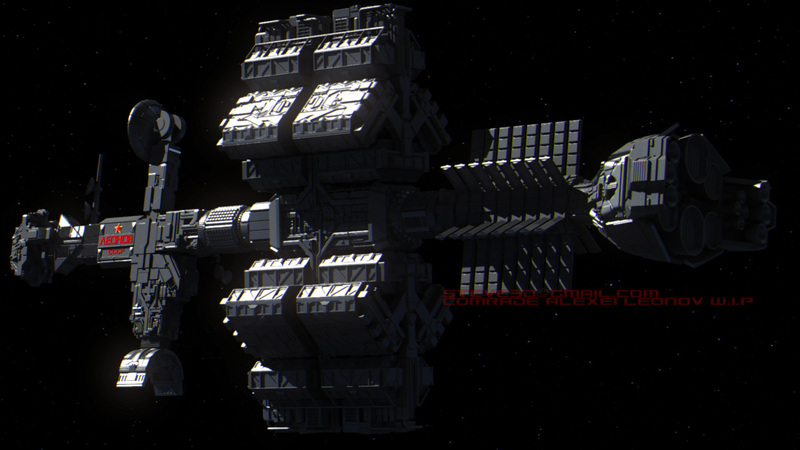 here's a test pic with some more dramatic lighting, a better material and some effects. I think this might be a nice setup for the artwork. Looks great, but who is this "Ay-O-Hob" ? But it's missing a guy and a vending machine. Outstanding work Coolhand. How does the Ionia class dock with it? ahahaha.. you guys... Really, Leonov keeps its wending machines on the inside. Ionia is not a part of the 2001 universe, but i think you could "dock" the designs with Leonovs handy, if vomit inducing universal docking system. The same one it uses to dock with Discovery in the movie. Yes, it was released during my discovery build, at least i only became aware of it once i'd completed discovery, and had to go back and redo the modules as a result. Definitely a recommended source of references for these models. 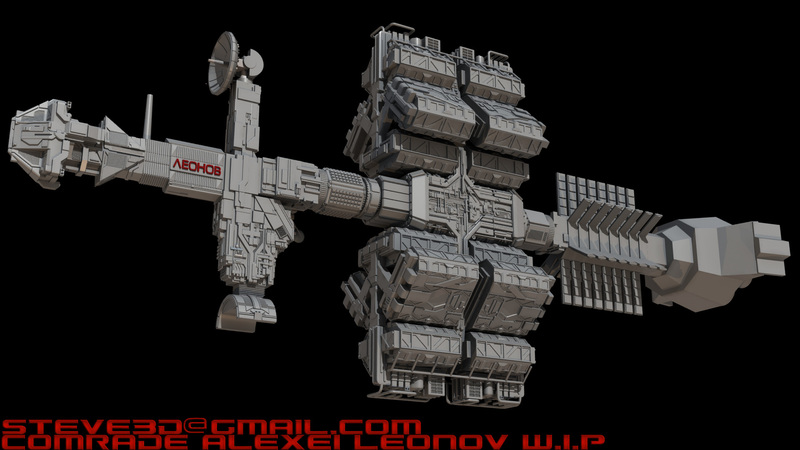 Whoaa, the Leonov is one of my favorite Sci-Fi ship, and this model is looks sweet! Hey thanks all, and thanks for commenting on both threads :thumb: if Leonov is one of your favourites, you're spoiled for choice here at the moment. Here's an attached still from the animated feature, 2011, detailing Leonovs crew returning to a changed planet. Only kidding, but if ever there's a year for some devine intervention, to unite humanity and make us all look up for a change, I think this is it.